1. Customer books Guest House from GuestHouser. 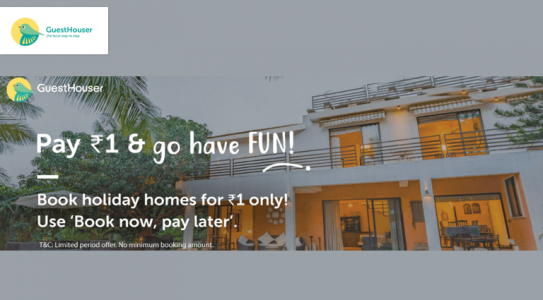 GuestHouser is India’s largest ecommerce portal to discover and book extraordinary vacation rental. GuestHouser means accuracy, privacy, value for money, and flexibility. Become a GuestHouser Host, list your property and start earning while welcoming Guests into your home. Indians can opt for guesthouser.com to create a listing of their choice. Just look for your destination in our search bar and within seconds you’ll see in one page all the available rentals, with info to make your best choice: price, location on the map, ratings, photos and services. Holiday rentals are a progressively popular alternative to traditional hotel stays. Why? Because they offer travellers the space, conveniences and privacy of home when on holiday… along with wonderful value! Select from thousands of different rentals across the globe: chic apartments for solo business trips, cozy cottages for romantic getaways or large villas for family holidays. For rests to suit your needs and particular travel style, there’s nowhere better. Whenever you plan to go on a vacation, you are bound to get confuse what to choose from variety of option. You can search on GuestHouser for your preferred villa, guest house, heritage, apartment, rustic huts, tents, houseboats or tree houses. With Cubber, you can get an additional cashback on GuestHouser when you rent holiday homes on the portal via the Cubber app. This cashback is credited to your Cubber wallet and is over and above any discount, deal or offer that GuestHouser may be offering. This offer is valid only for Cubber Prime Members. Take your next trip only with GuestHouser.